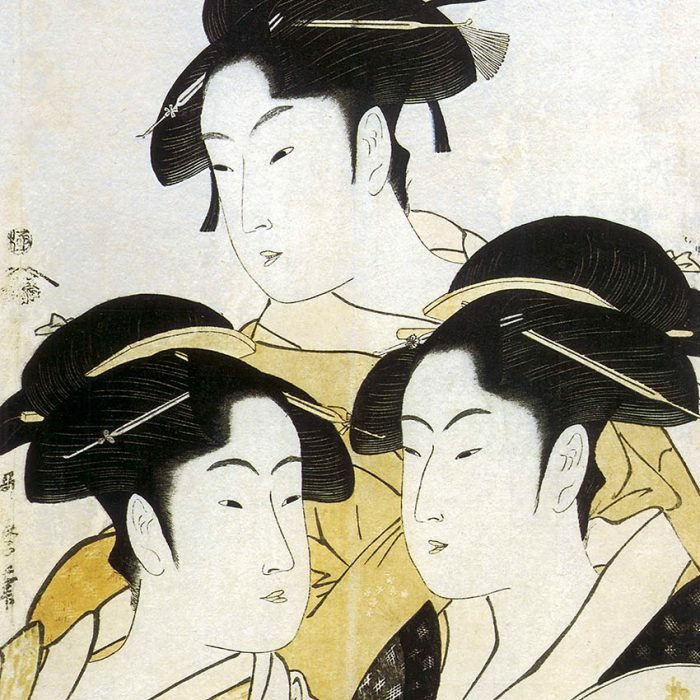 Kitagawa Utamaro c. 1753 – 31 October 1806) was a Japanese artist. He is one of the most highly regarded designers of ukiyo-e woodblock prints and paintings, and is best known for his bijin ōkubi-e“large-headed pictures of beautiful women” of the 1790s. He also produced nature studies, particularly illustrated books of insects. Little is known of Utamaro’s life. His work began to appear in the 1770s, and he rose to prominence in the early 1790s with his portraits of beauties with exaggerated, elongated features. He produced over 2000 known prints and was one of the few ukiyo-e artists to achieve fame throughout Japan in his lifetime. In 1804 he was arrested and manacled for fifty days for making illegal prints depicting the 16th-century military ruler Toyotomi Hideyoshi, and died two years later. Utamaro’s work reached Europe in the mid-nineteenth century, where it was very popular, enjoying particular acclaim in France. He influenced the European Impressionists, particularly with his use of partial views and his emphasis on light and shade, which they imitated. The reference to the “Japanese influence” among these artists often refers to the work of Utamaro.